As people, we have a habit of placing our more successful and famous peers upon pedestals. We cherish them, we worship them and we create their image to suit our desires. Essentially, those that are deemed worthy are distorted and sanitised into perfect people. We make them into something that they never were or could never be. John F. Kennedy was such a person. One of the most powerful forces to govern humanity isn’t peace or war. It isn’t justice or injustice. It is martyrdom. Martyrs have shaped the world in revolutionary ways. Just ask any follower of Christianity. John F. Kennedy was perhaps one of the most popular presidents in the modern era. But his popularity transcended into a lasting legacy due to his untimely and tragic death. The real man was very different from the santised version that was available for public consumption. John F. Kennedy was a keen proponent for assassinating Fidel Castro, such aspirations jarred with his campaign idealism and optimism. 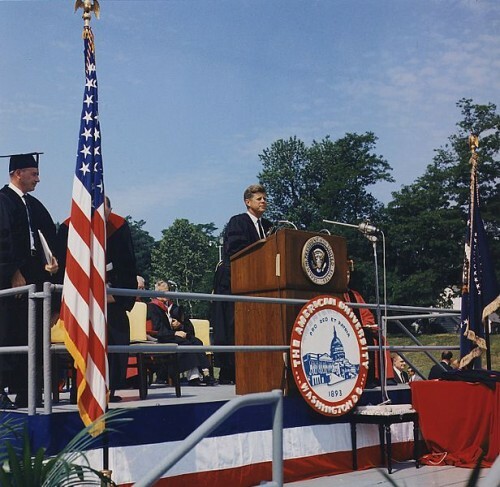 Incredibly charismatic and memorable, John F. Kennedy was a master of oratory and rhetoric. Ostensibly from the outside, he was one of America’s greatest presidents. However, delve closer and some painful truths begin to emerge that rip apart the ideal and restore the human. John F. Kennedy was an extreme womaniser, even going as far as having an affair on his honeymoon at the expense of his wife, Jacqueline. One of his most famous affairs was with the famous Hollywood actress, Marilyn Monroe, a highly intelligent but deeply insecure woman. Their relationship came very close to being made public when she sang her famous ‘Happy Birthday, Mr. President.’ Their tryst was quickly ended following that close call. Please check out Yellow Magpie’s Marilyn Monroe: The Original Blonde Bombshell for further insight. 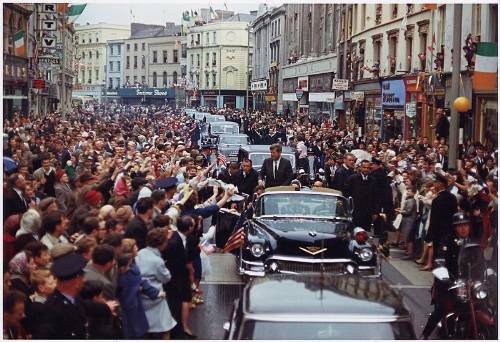 To those looking on from the outside, John F. Kennedy seemed to espouse the desired characteristics of vibrancy. He was very young for an American President and appeared to be fit. Certainly, this was also helped by his good looks. But those closer to him knew that the truth was very different. If one took a close look at John F. Kennedy’s face they would have noticed that this was a man who looked much older than his years suggested. His face look tired and worn. The truth is that Kennedy concealed a fact that may have made him unelectable in the public’s eyes. Kennedy had Addison’s disease. 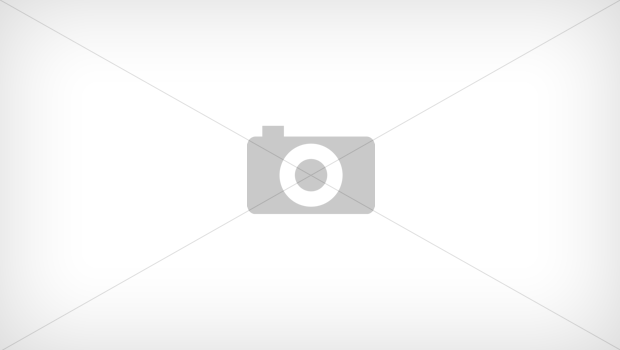 This affects the adrenal glands causing them to produce insufficient quantities of hormones. Addison disease has a whole raft of symptoms that have serious effects on those that suffer from it. Some of the main symptoms include fatigue, muscle weakness, weight loss, profuse sweating and muscle and joint pain. One of the most common identifiers of Addison’s is a deep tanning of the skin, even if the person is not exposed to the Sun at all. The fact that Kennedy persevered and carried on his duties is a testament to his commitment and courage as a politician. A man whose name will be forever inked in infamy on December, 1963, is Lee Harvey Oswald. Yet many people believe that Oswald did not actually kill President Kennedy. A former marine, Oswald has contributed to one of the most horrific and controversial assassinations in the world’s history. To this day, many people have doubts as to whether or not, one single gunman could fire so many shots in such a quick succession from such a difficult vantage point. The Sunday Times published an article mentioning an international team of men who they claim were really responsible for Kennedy’s death. The article goes on to state that the assassination team were arranged at the behest of the then U.S. Vice-President, Lyndon Johnson. In the history of the U.S. presidency only two men have ever been elected while unmarried. It seems unlikely that JFK would have become president if he remained single. 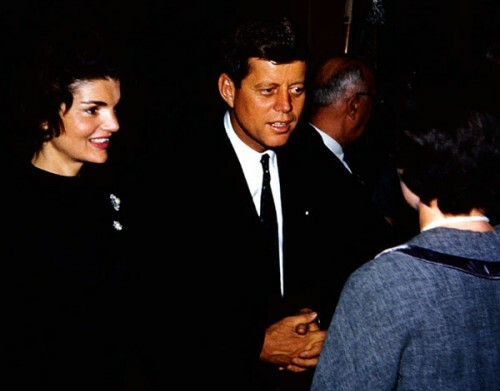 Jacqueline Lee Bouvier was the woman that Kennedy needed to bedrock his election bid. She provided domestic credibility which was necessary for a successful campaign. Jackie, as she was affectionately called by the public, put up with Kennedy’s numerous affairs, including a desperate phone-call from Marilyn Monroe, and nursed him to health during the period when Addison’s sapped his strength. During his presidential bid she was a rock offering support and doing all she could to ensure that her husband would become America’s next leader. Check out Yellow Magpie’s Jacqueline Kennedy: Wife Of President John F Kennedy to read more about this remarkable woman. All throughout Kennedy’s life there was a shadow lurking over him. 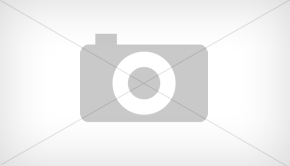 This shadow was in the form of his domineering, manipulative father, Joe. Joe Kennedy coloured the lives of his children in horrific ways. He constantly had indiscreet affairs with other women, including a nine-year affair with his secretary. He would also have illicit relationships with the girlfriends of his sons. Joe Kennedy was so brutal that he had his own daughter, Rosemary, who suffered from development difficulties, lobotomised. Under this malign influence John F. Kennedy was brought up in a world that on the surface looked wholesome but underneath was very different from its idyllic portrayal. Check out Yellow Magpie’s Joseph ‘Joe’ Kennedy: The Patriarchal Shadow That Hangs Over The Kennedys for further insight into Joe Kennedy. One can never fully escape the past and your upbringing. Certainly Kennedy inherited some of his father’s traits including his womanising habits but he was a far cry from Joe’s relentless egotism and quest from power. Whereas his father only cared about self-positioning, his son could see from other’s perspective and was highly thoughtful. He would use both of this characteristics when undertaking his greatest challenge. One other area that John F. Kennedy differed from his father was that of oratory. Although his father was used to public speaking, John F. Kennedy is widely recognised as one of the greatest orators of the 20th century. 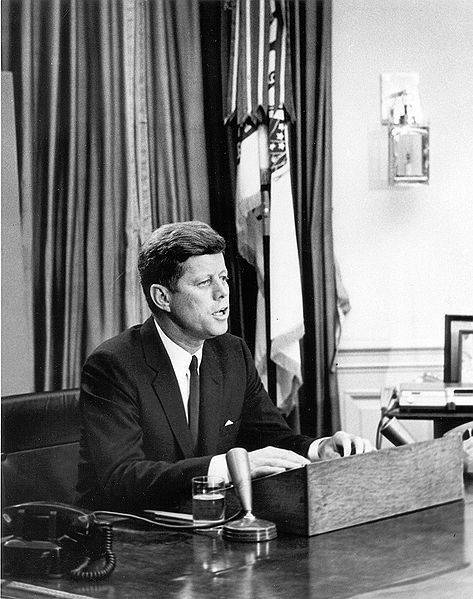 By far the biggest test of Kennedy’s career, and arguably the biggest in human history, was the Cuban Missile Crisis. The Soviet heavyweight, Nikita Khrushchev would test the resolve of the rather young Kennedy in an ordeal that terrified millions. 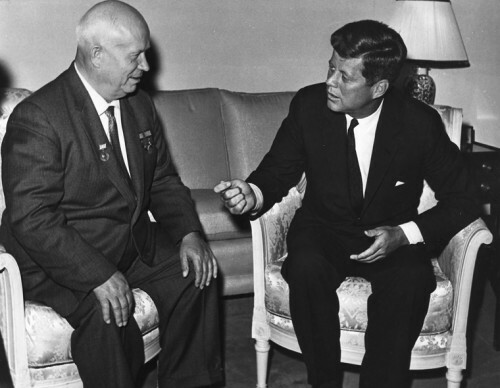 Khrushchev misunderstood and underestimated Kennedy who he saw as a light touch. 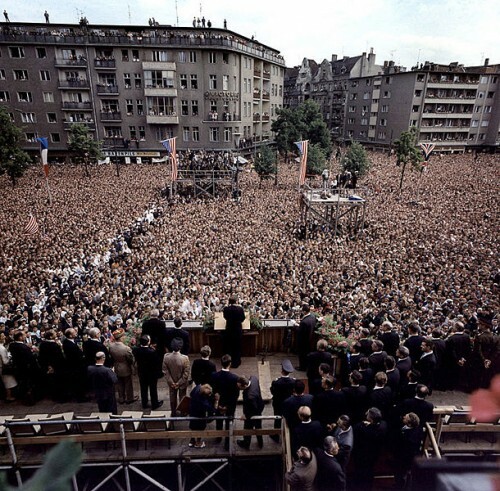 It was under Khrushchev that the Berlin Wall was erected after serious blunders By the U.S. Ambassador to Moscow, Charles Bohen, who publicly stated that the USSR had a rest to restrict movement in East Germany. Emboldened by Bohen and other American foreign diplomats’ foolhardiness, Khruschev set his sights on supplying missiles to Cuba in an attempt to build a Soviet base. Backed into a corner by Khrushchev, Kennedy would have to face a gauntlet that twenty years previously had not existed. 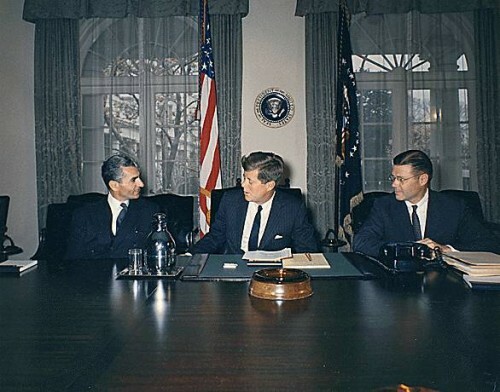 The nuclear arms race and the presence of the fusion bomb, meant that Kennedy could not afford to back down and let the USSR have a base so close to American soil. Yet, he could not directly engage with the soviets either and risk a full-scale nuclear war. He settled for the only option that worked. A military blockade of Cuba to prevent the USSR from arming the island. In the end the question of whether Kennedy was a virtuous paradigm of human behaviour must be asked? This has been the way he is portrayed. The answer must be that he was neither an angel nor a devil, he was just another human who rose to tremendous prominence. John F. Kennedy secured his place in history when his mortality was cruelly and crudely cut short on that faithful winter’s day in November. The ultimate legacy of Kennedy is easy to understand if we remove him from the equation. If he was not president, if the United States had selected someone less capable and with a heavy trigger finger then the world would now be a heavily scarred and entirely different place to live. The human race could be a dying species ill-equipped to deal with radiation poisoning and tainted food sources. Our lives rest on the decisions we make. Whether we decide to excel our careers or flounder in a sea of underachievement. Whether we choose to be better citizens or plunder from others. Whether we pick ourselves off the ground or whether we lay there permanently. The choice is ours. Generally our choices affect ourselves and those we interact with. At the most a single decision that we make will on average affect perhaps one thousand people both directly or indirectly. John F. Kennedy made a decision that affected billions and future billions. With one gesture, a few spoken words he cast in motion a sequence of events that guaranteed our safety for a few more decades at least. It was but one call but it was the right one. Brothers: The Hidden History of the Kennedy Years is an engrossing and thrilling read that highlights the roles the unruly FBI and CIA played in both the brother’s lives. It also details the dangerous trigger-happy joint chefs of staff and their desires to go to war with the USSR. An absorbing book – your eyes will be firmly ajar after reading this. You can obtain Brothers: The Hidden History of the Kennedy Years here from Amazon. For people living in Ireland or the United Kingdom you can access Brothers: The Hidden History of the Kennedy Years here. For those living in Canada you can obtain Brothers: The Hidden History of the Kennedy Years from here. For Germany: Brothers: The Hidden History of the Kennedy Years . For France: Brothers: The Hidden History of the Kennedy Years .